I am blushing. Carol over at http://ascotintennessee.blogspot.com/ has surprised me with this wonderful award. As bloggers, we share our lives and passions and hope to inspire along the way. I have gained so much, from so many that receiving this is quite a thrill for me. 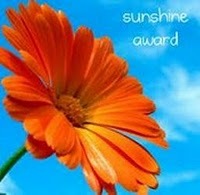 The Sunshine Award is shared with bloggers who have influenced us with their positive outlook and creativity. I hope you enjoy my nominees as much as I do. I hope you visit these great sites and come to love them as much as I do. 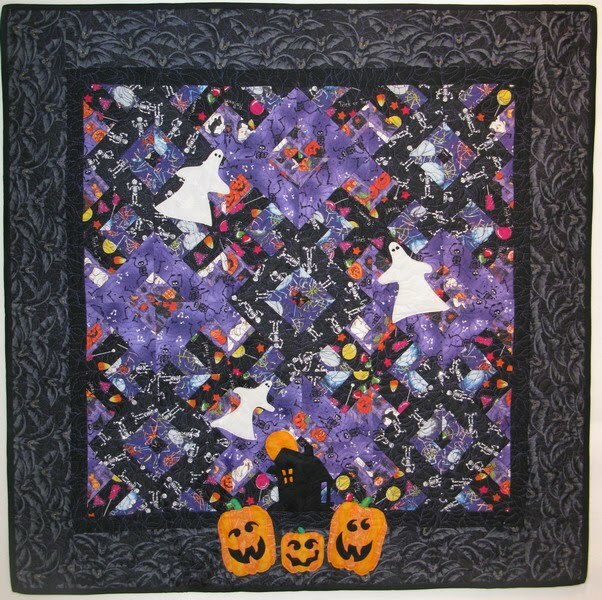 While I was gone, I worked on my Halloween Hidden Wells quilt. This little guy was so much fun. I spent a little time surfing the web for applique designs and came up with this combination. These designs were from Angies Bits and Pieces as well as Fat Cat Patterns. As we all know I can't seem to get enough of Hidden wells and this is just another reason why. It is so versatile that I can make almost anything I can dream up with scraps and have a very unique quilt when it's done. Best yet, it looks like I planned the project and I didn't. Once it was pieced I knew that I needed some applique to complete it, that was about all the "thought process" that went into it. Oh yeah, and while it doesn't really show here, the ghosts are done in glow in the dark fabric, so when I turn off the lights I have a truly haunting wall hanging! 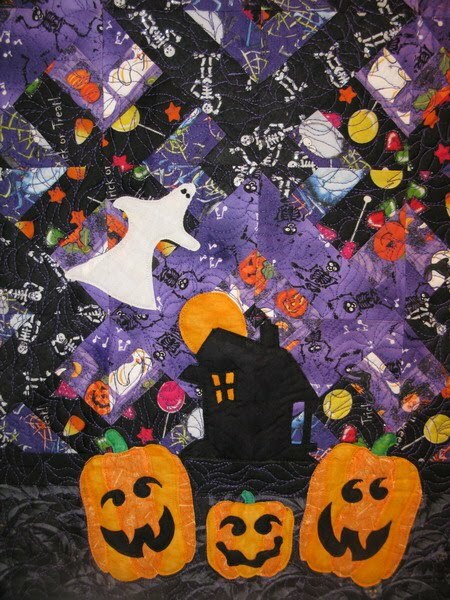 :-) :-) I love Michael Miller for coming up with glow in the dark fabrics. I use them a lot in my baby quilts too. I have found it hard to find during the year, but Halloween time it's available, so stock up while you can! Show me what you come up with and I will show you mine! I am deep into piecing my new Alaska Shop Hop quilt 2010. All the blocks have arrived and I hope to have something to share with you very soon! It had to be, as I was mailing off the quilt to my partner, the same was being done for me. This wonderful little beauty came from Sue in Indiana. I just love the colors and that wonderful border. Gee Sue, you have read my mind. It is perfect. We have such a great bunch of gals at Quilted Table, if you haven't done so, you really should check us out. There are monthly table runners we make from free Internet patterns and then our special swaps that happen about 4 times year. It is a great way to share and make up some quick and easy little projects. You won't be disappointed. Along with my little quiltie, Sue send some thread socks, a great fall panel print and the coolest mini rotary cutter. I have never seen one so small, but I know it is going to be a great addition to my sewing room. Thanks Sue, your a sweetie! I would like to take a little time to remember all our brothers and sisters who lost their lives Sept 11. Hard to believe it was 9 years ago already. Working for an airline, the memory is never far away, but today it has special meaning for me. I will be flying this evening. It was planned that way, as my memorial to them, and to keep our freedom by not allowing it to paralyze us. I have on my special Commemorative FBI/9-11 pin that one if the agents, who flew from Denver last week, gave me when I checked him in. I promised him it would be on tonight on my flight, and I am keeping my word. May all our 9-11 angels be watching over us! Recently I had a request for information on the Bulls Eye Quilt that I made a couple years back. EvaLena, here it is. :-) The inspiration for this little guy came from something I saw at a quilt show. It is nothing more than scraps. I took several different cream color tone on tone prints for the background, then went to work on my stash for the circles. You can use anything you can get your hands on, that is round, as templates. Having a ton of Tupperware lids, that was my template of choice! Just draw around the circles and cut out. On this one I used 3 different sizes and stacked them. Just raw edge appliqued, then after it was all quilted, I clipped the circles and washed it 3 or 4 times to make the edges of the circles "bloom". With summer dwindling away, it is time for the Yahoo Quilted Table, Fall Pumpkin Swap. This time we had the pleasure of using Rachel Griffith's very fast and fun little pattern. My quiltie is finished and ready to find it's way to it's new owner. If you are looking at a quick project, this is a great choice. I can hardly wait to see how everyone has done theirs. I have still been working on Hidden Wells, and have a bright and boo-tiful little surprise to share very soon. I have been burning the midnight oil so to speak, and have finished the Hidden Wells "tutorial" quilt. Hopefully it all makes sense now. I tell you to vary your colors wildly, then I go and do just the opposite. I had a game plan, and it came together thank goodness. For this quilt I combined some of the cute little critters from the Bunnies, Bees and Bears pattern with the hidden wells to come up with a fun baby quilt. When I give myself permissions to think outside the box, I am always delighted. I just don't know why doing so, is as difficult as it is at times. That animal print HW quilt is still dancing in my head so be on the lookout. You never know what will pop up next! Of course Halloween is rapidly approaching and I could ... Decisions decisions! What to do next????? ?